Where are you on this map? Are you 62 and qualified for Social Security? Are you 65 and now eligible for Medicare? Are you 70 & 1/2 and beginning your Required Minimum Distributions from IRAs? 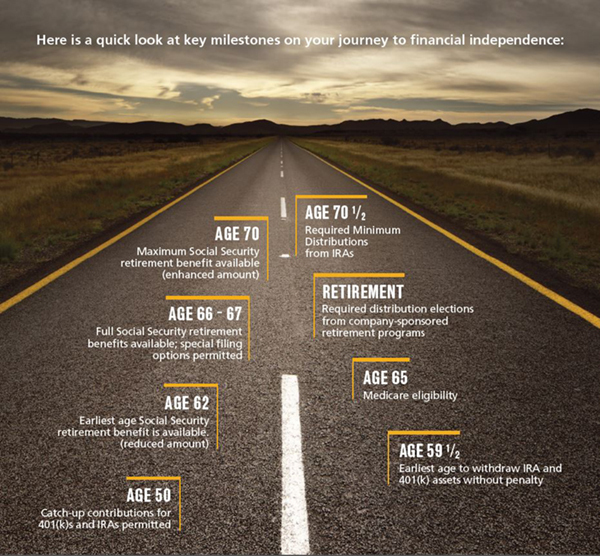 The Road Map to Retirement is a helpful tool to help simplify some of the key milestones you will need to be prepared to face with retirement. This process can be very strenuous and stressful. Our goal is to assist you through the process of going from full employment into full retirement in as much of a stress free manner as possible.